Yesterday, a watch friend mailed me some pictures of Rolex watches with brown dials. Appearantly, these dials faded from black to brown during the years. He will provide me some photos that I can use for this blog later this week. 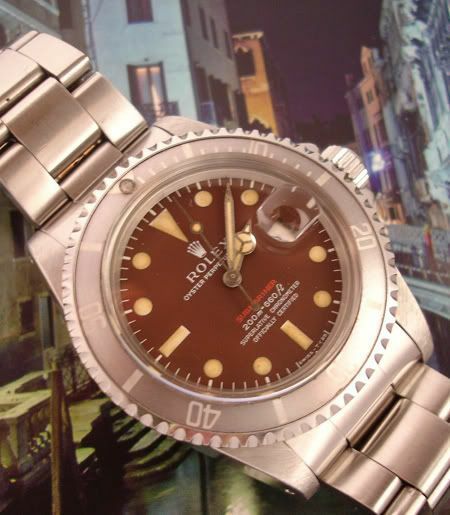 “It seems that all Rolex black dials have a percentage of brown pigment in the black varnish. The gloss dials would have a thin film of transparent varnish applied to give it that shiny look. Certain dials apparently had (maybe by error) had a higher prcentage of brown pigment in the black varnish and when exposed to natural Ultra Violet light like sunlight, the dial turns brown. This process can take between 35 to 50 years. Personally, I really like this aging effect on vintage watches. I hope to get back on the subject with more pictures. Ofcourse, any other input (in text or pictures) on the subject is welcome.